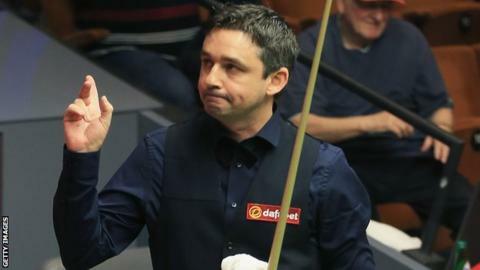 Alan McManus toppled former world champion John Higgins, then hit out at young players who spend too much time on the internet to stay at the top. McManus beat his fellow Scot 10-7 in round one of the World Championship at the Crucible as he stages a revival at the age of 43. "The older guys have stolen a march on today's young brigade," he said. "Younger people spend all their time on Facebook and it's killing their snooker." McManus, who is back up to 35 in the world rankings, said that players like himself and Higgins have been able to stay at the top of the game because of their work ethic. "I've thought for a few years now that, if you want to call them the old guard, guys maybe 30 or over, or 35 and over, are still holding a fair chunk of the top 16 and top 32," he said. "I think there's still room for guys at the age of 40 to 42 to compete at the high level of the game." McManus, who has reached the semi-finals at the Crucible twice, will play another veteran, 1997 world champion Ken Docherty, in round two. "The journey continues for myself and long may it last," he said. "The older guys can hang in there because they have the dedication that a lot of younger guys don't have. "They are too busy reading and writing about snooker rather than getting the nut down and doing what they should be doing and practising hard. "The young guys, not all of them, but some of them, are taking their eye off the ball and spending too much time on the internet and they should be practising hard." McManus has been in the spotlight not only for his snooker this week but his tartan trousers, the result of a hotel-room conversation with fellow Scottish snooker player Anthony McGill. "He was going on about tartan waistcoats and I said if anyone gets to Sheffield this year why don't we get tartan trousers," he revealed. "We had kind of forgotten about it and it wasn't until we qualified that I thought let's do it and have a bit of fun." McManus admits that they are the only pair he brought with him to Sheffield and that he has had trouble stopping them from slipping off during play. Asked if they were a size too large, he replied: "For normal day-to-day wear, they're not, but for bending over they are. I just didn't bring a belt."